Note: The 1047_1B is identical to the 1047_1, except that you have the option of which cables you want to include. These 5-wire encoder cables can be soldered onto an encoder in order to easily connect to the 1047. 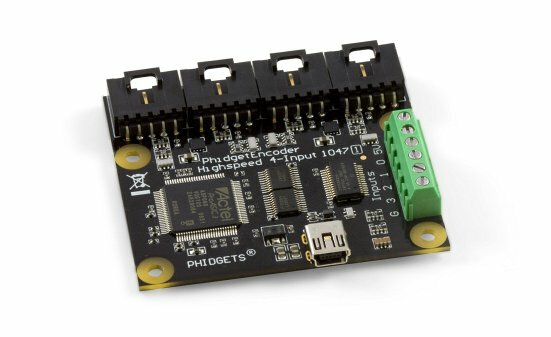 Connect the encoder to the 1047 Encoder Phidget using one of the included encoder cables (Soldering may be required). Now that you have everything together, let's start using the 1047! In order to demonstrate the functionality of the 1047, the Phidget Control Panel running on a Windows machine will be used. Linux users can follow the getting started with Linux guide and continue reading here for more information about the 1047. Toggle the Enabled checkbox to enable/disable the 1047. The 1047 can be used with a wide assortment of mechanical and optical encoders. The encoder should be of quadrature output type, indicating that there will be two quadrature output channels (usually labeled A and B) and a third output channel (only on some encoders) to signal when the index pin (a reference point for zero position or a complete revolution) has been reached. 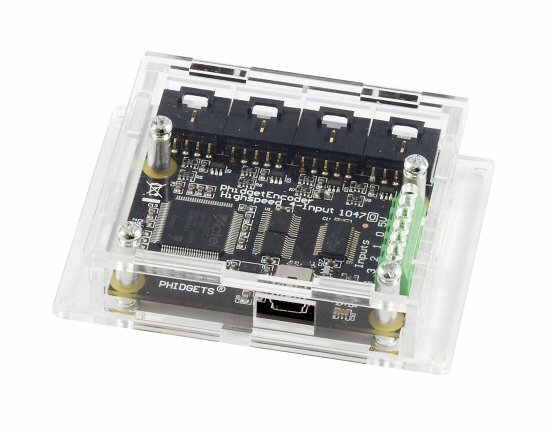 The 1047 is able to read four encoders simultaneously. Encoders are not powered up until all initialization of the device is complete. 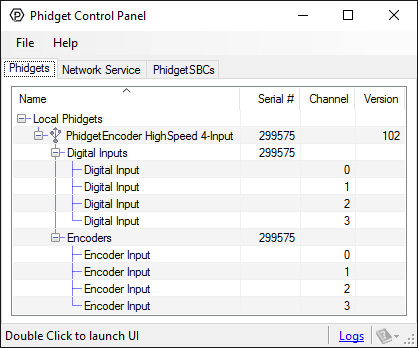 It is possible to enable some or all encoders, depending on how many of the channels are being used. This can also be used to reduce power consumption when certain encoders are not needed. The 1047 has the added ability to time the duration between a group of quadrature changes. The time is returned in microseconds. This time value can be used to calculate velocity and acceleration with very high precision. If the number of quadrature counts per revolution is unknown for a particular encoder, this value can be determined by using the index signal. In addition, it is possible to monitor how many counts have occurred since the last index. 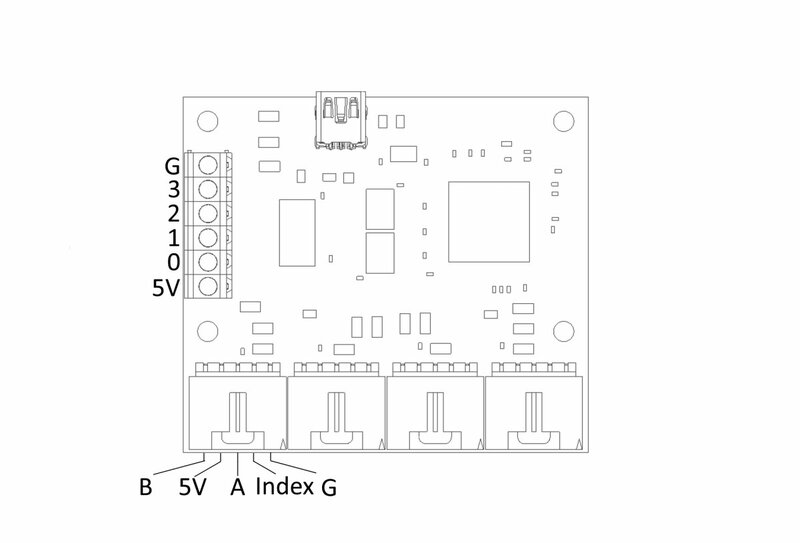 The index signal is an output only on certain encoders. 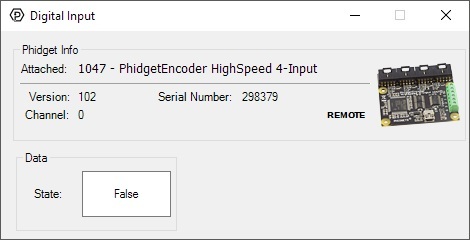 Refer to the encoder’s description to check if this third output channel exists or not. If the encoder does not have this signal, it is still possible to use it with the 1046, but an event for the index will never get triggered. The maximum rate of the 1046 is specified at 250,000 quadrature cycles per second. Since this device counts pulses rather than cycles, you could also say that it counts a maximum of 1,000,000 pulses per second (since there are four pulses in a cycle). 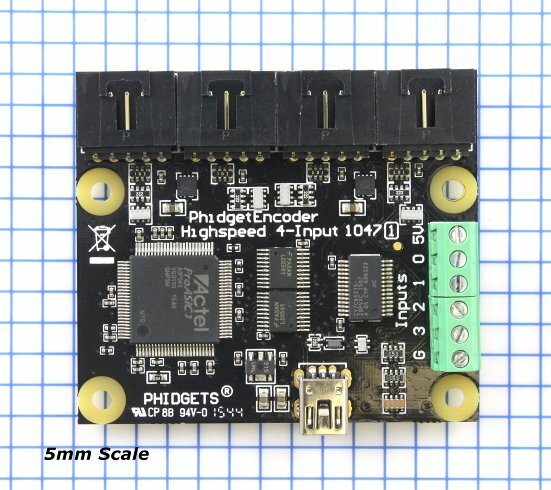 In your application, these numbers relate directly to the number of revolutions per second you wish to measure, and the number of counts per revolution specified for your encoder. 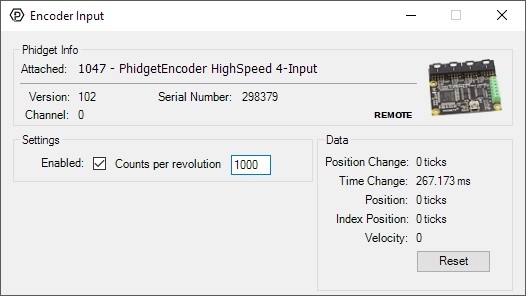 If your encoder's wheel has 1000 counts per revolution, then the limit on measurable revolutions per second is 250, or 15,000 rpm (which, for the 1047, corresponds to 1000 position changes in software per second). One of the most common problems encountered with connecting encoders to a 1047 is a strange jitter characterized by the encoder position appearing to switch back and forth between 0 and 1 or -1 and nothing else. This is usually indicative of a bad connection on either the A or B channel. You should check that the wiring is sound and try again. The 1046 incorporates a 10 kOhm pull-up resistor on each line from the encoder input connector. If your encoder is mechanical, these pull-up resistors eliminate the requirement to add your own external pull-up resistors. Some optical encoders will have a simple photo-transistor/open-collector output. The 10 kOhm pull-up resistor may have to be augmented with a stronger parallel resistor if your optical encoder datasheet calls for it. Some open-collector outputs will not be strong enough to pull this resistor to ground. These encoders are not compatible with the 1047, and may only work initially, or not at all. If you have any doubts, please contact us. Most optical encoders have a push-pull output, and the pull-up resistor is irrelevant, but weak enough not cause problems. We have reviewed the following encoders, and found that they can be used with the PhidgetEncoder Highspeed 4-Input. 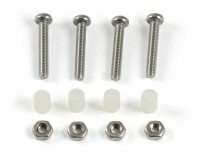 This is not meant to be a comprehensive list but should be used as examples of the type of encoders that can be used with the 1047. Each Input uses a 5-pin, 0.100 inch pitch locking connector. The connectors are commonly available - refer to the Table below for manufacturer part numbers. 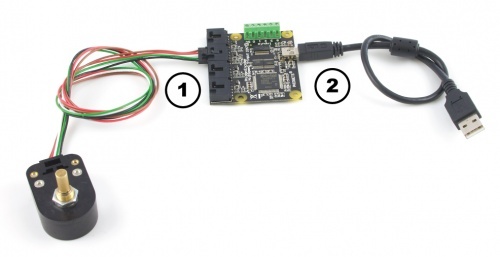 If you want to know more about encoders, check out the Encoder Primer. If you'd like to know more about the digital inputs on the 1047, visit the Digital Input Primer.